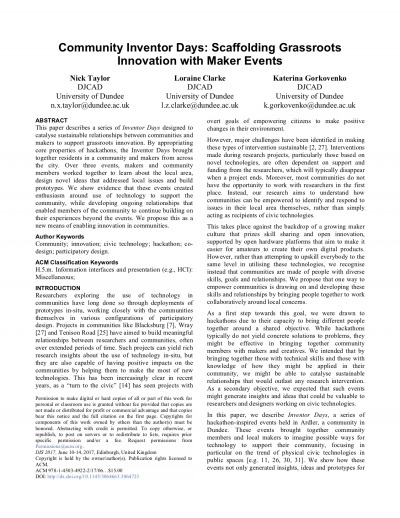 A couple of weeks ago I presented our paper Community Inventor Days: Scaffolding Grassroots Innovation with Maker Events at DIS 2017 in Edinburgh. It’s the first publication from our Ardler Inventors project, summing up the series of three hackathon-like events that we ran in Ardler last summer. The paper is open access and available from the ACM Digital Library. Way back in August last year, I wrote about the first Inventor Day, where we brought together people from Ardler in Dundee with makers from Dundee and further afield. The idea was that by forging relationships, creating skills ands generating enthusiasm, we could enable communities to build their own civic technologies. By the end of that first event, we’d made a lot of progress towards bringing everybody together as a group and had a good idea of the type of things we might want to make over the next two events. The other events focused more on prototyping and making, first by introducing a wide range of hardware prototyping platforms (Arduino kits, Raspberry Pis and plenty of glue guns), and then by moving the third event to Dundee Makerspace for physical prototyping using the laser cutter. We also wanted to introduce the makerspace as a facility that the group could continue to access, where they might find support and equipment that the project had provided. In the paper, we focus largely on the journeys of two key participants from Ardler who attended all three events, who we’ll call Steve and Rebecca. Steve came along with his son and daughter and worked with a few different people to drive forward his idea for a digital noticeboard. But even better was what happened in between the events: more than anyone else, Steve was continuing to explore electronics (including dismantling a plug-in air freshener to scavenge a PIR sensor), as well as seeking out opinions on their ideas. Rebecca was similarly focused on realising her idea for a musical game that would help to keep children away from a busy road. She started off exploring electronics and getting stuck into Arduino programming, but decided it wasn’t something she enjoyed and wished she’d experimented instead with some of the conductive inks we’d brought along. At the third event, she was more in her element, able to draw on her interest in craft when it came to building the physical device. The main goal of this project was to try build relationships and enthusiasm that would outlast the project itself, so it’s important not just to look at the events, but also what happened afterwards. We held quite a few small “aftercare” events after the main ones, including inviting everyone to our studio and a showcase event in the community. At each of these, we were struck by how much they felt like a group of friends coming back together. We also saw continuing activity clearly linked to the Inventor Days. Steve had really gotten hooked on electronics and had worked on a number of projects with his children, including Arduino-powered Halloween decorations. Rebecca had started a science club at the local primary school, which had originally emerged out of conversations with the school about the events. We’ve seen less ongoing engagement with the makers, and I think that’s partly because we’d needed to bring many of them in from other cities, but also because we didn’t fully identify or communicate what the value of the events was for makers. It was pretty clear people from Ardler got a lot out of it, and I think the makers did too, but was it enough to keep them engaged in the community? Something that emerged in various was across the project was the value of situating making in the familiar. Most people are not intrinsically motivated by technology or the act of making itself, but we found we could involve people in these kind of activities if it was motivated around things they cared about: improving their community, or having a fun Saturday with their kids. This also emerged in the sorts of roles people were playing in groups: they brought their own knowledge and skills that could be drawn upon. The second major finding relates back to the project’s goals of sustainability and legacy. While it’s true that our intervention as researchers was essential in facilitating the events, we did establish the feasibility of short-burst interventions for bootstrapping this kind of activity in the community. I think this is significant, because it brings what we did into the realms of possibility for a lot of community organisations and local authorities, who don’t have the capacity to do the kind of deeply engaged multi-year community technology projects we’ve done in the past. Running two or three events to jump-start the sort of enthusiasm we saw in Ardler, on the other hand, is well within their reach. We’ve kept in touch with Ardler since the end of the project, and hopefully we can work with them again in the future. But in the meantime, we’re excited to sit back and see what our participants get up to on their own! This entry was posted in Ardler Inventors, Project Updates, Publications and tagged Ardler, dis2017, Inventor Days by Nick Taylor. Bookmark the permalink.